BERKELEY, CA � Should evolution's "survival of the fittest" creed be supplemented with an appendage that reads "survival of the catastrophic?" A team of Berkeley researchers, analyzing the history of impact cratering on the moon, has reported a surprising increase in the frequency of impacts over the past 400 million years that may have played a central role in the evolution of life on Earth. SCANNING ELECTRON MICROSCOPE PICTURE OF A GLASS SPHERULE BROUGHT BACK FROM THE MOON BY APOLLO 11. THE SPHERULE IS ABOUT 250 MICRONS IN DIAMETER. In the March 10 issue of the journal Science, researchers with the U.S. Department of Energy's Lawrence Berkeley National Laboratory (Berkeley Lab) and the University of California at Berkeley (UC Berkeley), and the Berkeley Geochronology Center (BGC) announced the discovery that impact cratering on the moon (and, by inference, on the earth) suddenly increased about 400 million years ago. "From our point of view, that�s in the recent past," says Timothy Culler, a UC Berkeley graduate student who is earning his Ph.D. on the project. Culler is one of the co-authors of the paper in Science, along with Richard Muller, who holds joint appointments with Berkeley Lab's Physics Division and UC Berkeley's Physics Department; Paul Renne, a UC Berkeley geologist and director of the BGC, an independent non-profit research institution; and Timothy Becker, BGC laboratory manager and expert in radiometric measurements. The data published by this team show that the impact cratering rate had dropped steadily until the unexpected rise when the impact rate returned to the same levels as 3.5 billion years ago. The sudden increase coincides with the "Cambrian explosion," a period in which life on Earth took off with a dramatic burst in the number and diversity of species. "Although most people assume that impacts cause death and destruction, it is possible that the additional stress of the impacts forced life to become more diverse and flexible," says Muller. "Just as we stress trees, through pruning, to make them give more fruit, the stress cause by catastrophic impacts may have forced evolution into new directions." Noting that the earliest records of life on earth date from the period approximately 3.5 billion years ago, when their results show the intensity of impacts was decreasing, Renne says: "Maybe, as others have speculated before, life began on Earth many times, but the comets only stopped wiping it out about three or four billion years ago." Muller originally suggested the dating of lunar spherules as a way of getting evidence for or against the existence of comet showers, brief periods when the number of comets in the sky increases, raising the risk that several of them are likely to hit the Earth at similar times. Dating the chronology of impact craters on earth is difficult because of erosion, sedimentation, and plate tectonics. Although lunar craters are preserved in a near pristine state, it was presumed that a sample would have to be collected from each individual crater in order to date it, requiring an expensive re-visit to the Moon. Muller contended that the required data could be found in any gram of lunar soil, including those brought back by the Apollo missions. The impact record would be preserved in spherules -- microscopic glass beads formed when droplets of molten basalt splashed out of a crater by the heat and force of an impact subsequently cooled and hardened. The Berkeley team obtained from NASA a gram of lunar soil inside of which they found 155 spherules. The age of each of these tiny spherules was determined at the BGC with an ultrasensitive technique based on the ratios between two argon isotopes. From the ratio of argon-40 to argon-39 as measured by neutron irradiation followed by laser-driven mass spectroscopy, the age of the spherules could be determined. These 155 lunar spherules ranged in size from less than 100 microns to more than 250 microns and came from lunar soil picked up in 1971 by the Apollo-14 mission crew near Mare Imbrium (Sea of Rains), the dark crater that dominates the moon's face. 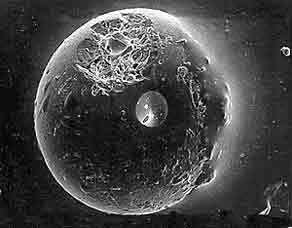 Statistical and chemical analyses showed that the spherules studied came from approximately 146 different craters. "Even though we don�t know which crater was the source of each spherule, the distribution of the ages of the spherules from a single lunar site should reflect the age distribution of craters on the Moon," Muller said. The results of this study not only carry implications for the evolution of life on Earth but also for our understanding of the solar system. Explains Muller, "It is not difficult to understand the slow decrease. It corresponds to a gradual cleansing of the solar system by Jupiter, the Sun, and passing stars. But it is difficult to conceive of a mechanism that could trigger an increase, particularly one that lasted 400 million years." Muller suggests that the sudden increase offers indirect evidence for a companion star to the sun. When the existence of such a star was postulated in 1984, Muller suggested that it be called Nemesis after the Greek goddess of retribution. "The increase in impacts could be due to a sudden change in the orbit of Nemesis," Muller says. "If a passing star perturbed Nemesis into a more eccentric orbit, that would account for the increase in impacts." Does a possible companion star to the sun cause periodic mass extinctions on earth?